Click Here Application for Kattaikuttu Function..
Firstly, the inhabitants of the village extend their boundless co-operation to anything that is done for their betterment and benefit bearing in mind that the promoters of this sacred art would also be encouraged to present the art at its best. Secondly, the serene calmness and nature's beauty which is well displayed and exhibited in the village environment would add their extraordinary grace to the divine music afforded by the musical instruments add rhythm to the songs chanted by the performers and make the performance an excellent one well apt to be presented in heavenly abodes. Thus the divine art of kattaikuttu-a wonderful folk art, came to be staged along the paths present in villages in order to unfold divine histories within easy reach of the common man. It is a divine, wonderful, delightful performance in which the music tone, ballad and graceful movements blend into one another and make the performance a remarkable one and empowers man. The art instills spiritual feelings in the hearts of the performance and the audience and inspires them to attain the lofty peaks of spiritual greatness. The folk art staged in the serene surroundings of the village bear the great divine touches of reality and brims with life due to the nature of presentation. Firstly, the augustness and feats of bravery of the holy ancient kings depicted in the various scenes of the divine art capture the hearts of the audience and presents a true picture and the manner of presentation looks realistic to the last degree to every eye. Secondly the rich costumes with which they (Characters) are clothed and the costly ornaments inlaid with precious stones that adorn the various parts of their bodies completely befit the royal characters. Thirdly the characteristic features of the royal characters are exhibited in such a way that life of the real kings (whose roles are enacted on the stage) is instilled into the respective characters which stand for the respective kings. Fourthly the audience and the performers feel that the incidents and events staged are actually happening just in front of them. The characters which take the role of celestials (when the performance is staged) look like real celestials in every respect and exhibit characteristic features and divine noble qualities of the celestials. Such characters gather all the energies they could muster to create the desired effect. The audience too watch the divine show with great Devotion therefore it could undoubtedly be said that both the performers and the audience are sure to be endowed with the blessings of the celestials since the very involvement and devotion created in them due to marvelous performance redeems the soul of its blemishes (Caused by sins) and lights the lamp of love for god and sows the seeds of all divine qualities in them. They yearn to become like the virtuous celestial characters (staged with the help of the divine art). Human beings come to understand the lofty thoughts and divine activities of the celestials through the divine art, as the art gives clear expressions of such thoughts and activities (of celestials). Sacred mask for the face, sacred bracelets for the fore arms, sacred plates for the chest, sacred gloves for the hands, sacred belts for the hips provide a majestic look to the characters who present themselves as holy kings in the holy scenes presented by the divine art. These fittings (masks, gloves, belts, bracelets and plates) are an exact replica of the fittings worn by the holy kings of those days. Many artistic designs present on these fittings resemble those that were worn by the holy ancient kings. Apart from this, many characteristic attributes of kings were presented to the audience through the divine art. All the noble, characteristic features earned the sacred name of 'Kattaikuttu' for the divine folk art. It is an age-old art quite popular in the villages and sub-urban areas and has been handed down by our ancestors since time immemorial and dates back to many ages before the counting of the centuries. It is an art which was so designed to make men (right from ancient man till the present man) acquainted with the way in which they should lead their lives in order to be blessed with all good fortune in their present births and to enjoy eternal happiness in their life after death. The epic-stories and episodes of mythical gods were presented through the divine art. The two great epics namely The Ramayana and The Mahabaratha which are honoured as the greatest epics of the world even today are in the form of long, narrative poems which described the great and heroic deeds of holy souls since the epics bear testimony to the enhancement of courage, the spirit of sacrifice, adherence to the principles laid down by the law of righteousness (The Law of Dharma).Even when tests and trials prompted them to swerve from the path of righteousness. The holy persons portrayed by the epics faced adverse situations courageously because the seats of truth and grace were sown and embedded in their hearts and they (Holy persons) were able to stand the test of time. Thus, the epics capture the hearts of the readers even today. It was the earnest desire of the learned persons well versed in the knowledge of the three classes of literature and had gained spiritual knowledge wanted to turn men away from the path of sin and make them march through the paths of righteousness by leading virtuous life in strict accordance with the rules laid down by the law of righteousness. So these learned persons chose the epics which could be presented in the form of the divine folk art (Kattaikkuttu) due to some important reasons. Firstly, the epics are in the form of long, narrative poems which could be presented in a manner which would be entertaining to the common man. Secondly the incidents and characters are so portrayed by the epics that they bear testimony to the saying, 'truth alone triumphs'. Thirdly the common man would be able to imbibe the great and heroic deeds of the holy persons portrayed by the epics, offer him courage to uphold righteousness even when trials and ordeals are at their heights and trouble him greatly. The epics make him understand how good conquers evil and passes all benefits to him and at the same time bestows him with eternal happiness after his present life. The divine visions and the divine wisdom of great souls well versed in the three classes of literature and the strict adherence to the rules laid down by the holy treatise named as "Sre Kagabujandar divine arts sastra" written ages ago by the great preceptor Sre Kagabujandar as molded and shaped the art to suit its purpose. Above all, it is marked out as an art of all arts, as it bears the foot prints of the great Preceptor and is blessed by him. Thus the divine art was structured to that effect so that it would serve the purpose for which it was born. With the three classes of literature namely- prose, poetry and drama as the basis of support the divine art was structured. The divine art was structured in perfect agreement with the three classes of literature. Prose serves as the body of the divine Art and makes the divine art function. Poetry instills life into the art and empowers it. Drama serves as the world where the divine characters play their parts. Thus we see that the three classes of literature make the art a compact whole. Poetry which instills life and prose which serves as the body go hand in hand to bring out the dual performance with the help of drama which makes the whole world a stage. In this manner the divine art is presented with its graceful movements combined with majesty and staged to the world at Large. The substance and theme of the divine episodes are brought out by the divine prose in the form of dialogues the divine poetry adds beauty gives expression to thoughts, the music afforded by the musical instruments add beauty which can not be expressed in words. The chanting of the holy songs to the rhythmic beat of the divine musical instruments attracts the attention of one and all. When the divine prose and poetry play their parts simultaneously acting which is constantly being done with great love and affection in compliance with the divine prose and poetry, the substance and theme of the scenes depicted are well understood in an entertaining manner by the audience by virtue of the divine performance of the art. The wonderful divine art with manifold greatness is great to such an extent that it is able to draw the attention of the celestials and delight them. Therefore it is undoubtedly an ancient art, which is always in its prime youth and it survives for the survival of the world. The divine art programmes begin with all their grandeur at night around 10-00 P.M. (ie: before midnight) in the auspicious hour (When Men are about to fall asleep) in the calm serene surroundings in the paths of the village, when all nature is at rest. The Divine art programme (Performance) draws to a close at sunrise. Taking into account the time factor-the auspicious hour, when the art begin to exhibit its performance and the sacred time duration the auspices hour before midnight up to the time of sunrise (When a new day begins) the art is considered to bean extraordinary, Divine, wonderful and a noble one. The time when the art is staged and its (Divine art) time duration make it very congenial to be audible to creatures and living things which are miles away and has its impact on them (Living and non-Living things). Sound waves travel long distances at night. Night is that part of the day which is serene and well apt for executing divine performances and divine works. As the divine art is performed in the sacred silence of the night, in a pleasant atmosphere in the open, all creatures right from the tiniest creature to the mightiest creation of god, take great delight and show more mirth when the art is exhibited in all its grandeur. The performance and the audience enjoy the art to the hearts content and the world is bestowed with all good fortune. The spirits of the Siddhas (a Class of Celestials who have acquired eight great mystic powers) Celestials, Sages, pervade such serene surroundings at night in the open air, the performers of the art and the persons who watch its (Divine Art) performance are certain to get the blessings of the whole lot of Celestials and thus enable them to enjoy all good fortune. The special feature of the art is that the holy scenes depicted from episodes leave and indelible picture in the minds and hearts of the performers, audience and others (who involved themselves in the art) so much so that they find a change for the better has come over them after having witness such performances. When the divine art is adorned with divine musical sounds afforded by the beat of the musical instruments and the powerful blend of the notes (Ragas) accordingly, fills the air with divine fragrance and presents a real sumptuous feast for the eyes and ears of living beings and instills lofty thoughts in them. The rare divine notes (Ragas) which blend in perfect compliance with rhythmic beat (Thalam) of the music instruments and heighten the effect of the divine art. Since the performance (Of the Divine Art) gets over at Sun rise, all the performers, audience and others who extend their involvement and co-operation to the art, worship the sun god. The sun god is always worshipped at the close of such divine performances as he is an outstanding God to be worshipped for driving away darkness and spreading light in its place by His Powerful rays. Since the Sun god is worshipped in the early hours of the day that is at sunrise by all on completion of the performance, a divine lamp will be lit in their hearts. Thus the divine art paves way to drive away evil and enlighten the hearts of men to make their lives sublime. The life style of man has changed since time immemorial. Change is the law of nature according to God almighty. But this art is an exception to the great divine law. The divine art is still practiced and performed according to the divine rules laid down by the divine treatise- "Sre Kagabujandar Divine Arts Sastra" written ages ago by the great Preceptor. It is an art of arts, a virgin art uninterrupted by other arts which have cropped up these days. All above mentioned features go to prove that the 'Kattaikkuttu" is every inch a divine art. The age old art had its birth in the northern part of Tamilnadu (South India) which includes the districts of Chennai, Vellore, Kancheepuram, Thiruvannamalai, Villupuram and Cudalore. The birth place of the art distinguishes the art as a Supreme one. Tamilnadu is a place of unity in diversity. Peoples speaking different languages, following different cultures and adopting different traditions live as an integrated whole, in this particular state. Thus it is quite reasonable why the divine art had its birth here. Though the art had its birth in this humble divine place, its fame and name had spread throughout the length and breadth of the world and reach its zenith. 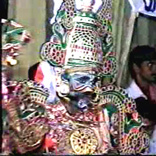 Thus the Divine art was known by a popular name 'divine path way folk performance' (Terukkuttu). All the divine scenes presented in the form of the divine art, have been adopted from the divine works written by great sages who lived in the northern part of Tamilnadu (South India) - the birth place of the art, ages ago. Sages who lived ages ago were endowed with rich wisdom and attributes of God Almighty himself so much so to say that they could be hailed as the very incarnations of God. They possessed great divine powers which enabled them to fore see and foretell what would happen. The dramas staged through the divine art have been return in their peculiar styles by various poet laureates. There are three divine styles adopted by this divine folk art. They are known as the Northern style, the Southern style and the Western style. The artists who hail from Madras (Chennai), Kanchipuram, Vellore and Thiruvannamalai Districts which comprise the Northern part of TamilNadu follow the Northern style. The Northern style has a special divine name of Kattaikuttu to its credit. The artists who hail from areas around Villupuram and Cuddalore follow the Southern style. 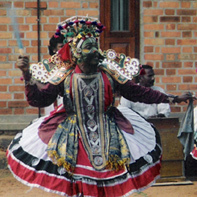 The Southern style has a special name - Divine path way performance (Therukuthu). Artists, who hail from the Dharmapuri and Salem Districts, adopt the Western style. 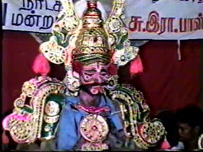 This Western style has the popular name of divine path way performance (Therukuthu) to its credit. The divine, folk art has been passed down through the generations of families whose ancestors were well versed and is performed by them. The three divine styles (of the divine art) differ from each other in certain aspects such as costume, manner of performance or presentation and the powerful blend of notes to the rhythmic beat of the musical instruments. While taking into account the specific features of the different styles of the divine art the Northern style seems to be a tough one. The artists of Kanchipuram, Cheyyar, Vandavasi and Uthiramerur have noted all the specific aspects and features of the art, taken them into account and the art is presented in such a way (by these artists) that the divine art is at its best. The maternal ancestors of Sre Bhaaskharamaharishi who live in sothiyambakkam and his relatives of his ancestral home are well versed in the divine art. The supreme preceptor Sre Kagabujandar adopted Sre Bhaaskharamaharishi has his divine son, as he hails from a very ideal (pious) family and was born as a divine son of a chaste mother. When he attained the age of thirteen or fourteen, the supreme preceptor Sre Kagabujandar began to present Himself in his dreams (of Bhaaskharamaharishi) and visions and makes the maharishi always feel His holy presence when he is engaged in some work or is at rest. The holy presence of the preceptor inspires and guides the maharishi in all his divine activities. The sprit of the supreme preceptor in him (maharishi) instills spiritual and noble thoughts and guides his goodness in all his activities. The divine folk art (which is staged) in strict accordance with the holy treatise - Sre Kagabujandar divine art treatise has its desired effect on the maharishi right from his childhood days. He enjoys the special features of the divine art inch by inch and his involvement in it brings great joy to his heart and soul. The maharishi leads an ideal life, in accordance with the law of righteousness. He has established the Kagabujandar Guru Temple at Sothiyambakkam - Pavoor, which lies in the celestial border of Kanchi, for each everyone to worship and receive the blessings of the great Guru and his consort Baguladevi. The Kagabujandar Guru Temple also known by the divine name of Amruthalok, is a unique divine place as it is the only Guru Temple in the world where the devotees receive the divine blessings of the Guru and his consort simultaneously. It is a wonderful sight to see the supreme preceptor bless the world with his sixteen mighty, divine hands. The Maharishi bestowed with humane qualities which mark him has a great, noble and pious person. Thus we see that the maharishi�s life is in every way an ideal life, which could be an inspiration to other men. In compliance with the holy advice offered by the supreme preceptor, Sre Bhaaskharamaharishi stages divine folk art programmes with artists who are well versed in the sacred art and always keeps indulging himself in the growth of divine art and leads a pious life. Noble thought come to noble men (endowed with virtuous qualities) from every side such noble thoughts inspired the Maharishi to do all he could to develop the art to its last degree. He had the good fortune of acting divine roles and divine fragrance adorns and accompanies his performance at every step and his performances are quite noteworthy. The Maharishi at taken up many important roles from divine episodes and had presented them in the form of the divine folk art has he aspired and still aspires to be one with the art. Thus we come to understand the great enthusiasm of the Maharishi towards the growth of the art. All nature obeys God, but only man disobeys God. He has endangered nature and her wonderful creations. Man�s evil deeds keep him away from God. He uses all the natural resources available, to his advantage and has hindered the free operation of such resources and gifts of nature and has thus paved the way for destruction. Sin has turned man away from God. So God condescended and offered the divine art as a gift to mankind and blessed the divine art so that it would pave the way for man to lead righteous lives. Thus, this art which was brought forth to the world for the promotion of peace and contentment is indeed a divine art. Goddess Saraswathi is worshipped by men who carry on different trades. They pay their respects and worship her in order to make their lives happy and prosperous. Goddess Saraswathi, the God of all the sixty four divine arts blessed the divine folk art and offered it to the world for the betterment of mankind. But it is quite interesting and astonishing to note that the Goddess had instilled all the charm and divine powers present in the other arts into this particular, unique art and empowered it into a holy art. Thus we can enjoy the charm of all divine arts through this unique, divine art. 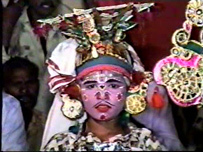 The performers are adorned according to the roles they enact. They are adorned by way of costume, adornment of the body by use of divine perfumes and powders, adornment of the face, by use of shining powders to bring out the divine brilliance on the face, adornment of pictures and paintings by use of various combination of colors on them according to their respecting roles in order to create a lasting effect, adornment of things with glittering strips of material pasted on them, and the marvelous adornment of the holy symbols heighten the effect of divine art program and their charm is worth to be enjoyed by one and all. Such adornments go a long way in drawing the complete attention of the audience and set ablaze the fire of devotion which would enable them to pay heed, grasp the morals and adhere to them in their lives. The musical notes blend with the rhythmic beat of the musical instruments and provide a divine effect. Every stanza sung by the singers who are at the back of the stage in a chorus after the song has been sung by the performers on the stage. When the first stanza has been sung by the singers on the stage, the song is repeated in a chorus by the singers who are at the back of the stage. Then the singers on the stage sing the next stanza. After this, the stanza is again sung in a chorus by the singers who are at the back of the stage. In this manner every stanza sung by the singers (on the stage) is again repeated by the singers who are at the back of the stage. Such a procedure is adopted, so that the audiences come to understand the meaning of the musical notes. This is a special feature of this divine art. According to the musical notes and graceful moments the rhythmic beat of the musical instruments blend together, raise divine sounds which mingle in air and thus assist in producing a divine effect. The audiences take great delight in enjoying the divine art as the musicians and singers are endowed with the gift of music and song. When songs are sung and scenes are enacted in a graceful manner, the musical instrument called Mugaveena, the seven divine sounds which could be raised by a kind of musical box, the notes afforded by the Tubla (a kind of musical instrument), a mixture of musical notes known as Rupaka and Jampaka which are used frequently with the music and song add their charm to the performance. The songs chanted and scenes presented with all their grandeur in the best way possible, mingle in the air and fills it with divine fragrance and carries the fragrance to creatures far, far away from the place where the performances are staged. Such performances have their desired effects on those creatures. It is indeed a sacred wonderful experience to enjoy such a rich sumptuous feast, a real treat for the eyes and ears as the music song and action are all rolled into one and presented in the form of the divine folk art. This divine art highlights the conduct, lofty, ideal thoughts and the direct benefits caused by useful, advantages talks and indirect disastrous effects brought about by engaging in useless talks which bring about evil. Thus we see that the divine folk art reflects the virtuous qualities, culture, noble thoughts etc., and excels in its great charm. Each and every character is created in such a way that he is endowed with divine qualities i.e. to say that such characters are blessed with attributes of God himself. Each and every characters created is presented in such a way that they adhere to the moral code of laws laid down by the law of righteousness. Thus, this art is worth to be enjoyed. The greatness of all the divine arts of our motherland India (which is reflected by her rich cultural heritage) is brought out by the characters presented in the divine scenes. The rich and clear explanations of the different treatises on astrology, medicine, magic etc.., are brought out and delivered to the public through the divine art performance and makes its unique appeal on man. Thus we come to know of the wide area of its operation in many fields. The divine art had taken birth and had been so designed to suit the sole purpose of unfolding the supreme greatness of the celestials portrayed by the greatest epics - The Ramayana and The Mahabharata to the world at large. The divine art has been so created and structured so as to bring out the unique spiritual greatness of the holy character �Panjaali� alias �Draupadi� and make the presentation of scenes which bring out her greatness in the most, realistic way, in a manner thought would make one feel that the events are taking place in reality, while they witness the scenes in the performance. The great epic Mahabharata portrays and narrates the reign of the five �Great Pandavas� namely - Dharma, Bhima, Arjuna, Nakula and Sahadeva who are predicted as heroes of the five great powers namely - Land, Air, Fire, Water and Sky by the epic. The epic gives an elaborate narration about Paanjali who is born as the mother of the five great powers, takes the form of a consort and extends divine rule with the aid of her secret divine powers and presents her as the very embodiment of Goddess Aadhiparashakti who reigns supreme. Thus it is quite obvious that Paanjali the very embodiment of Aadhiparashakti is unique great divine power who lives and empowers the five great powers (Land, Water, Air, Fire and Sky) and makes them function to their very best by instilling her secret powers into them. Likewise, Draupadi the very embodiment of Aadhiparashakti extends her over lordship over the five great powers by extending her secret divine rule over them through the five great Pandavas. Thus we see that Mahabharata speaks volumes of the spiritual greatness of Paanjali who has numerous divine powers to her credit. All the divine characteristic features which mark the epic has an outstanding one, are clearly brought to the fore through the wonderful divine art of Kattaikutu. A temple festival devoted to Goddess Draupadi is being celebrated since time immemorial in the Northern part of Tamilnadu. The celebration is carried out for about Twenty to Forty days, year after year. The festival is of great importance, since ancient days and is celebrated with great religious fervor according to the wonderful traditions and customs of the ancient days. When such temple festivals are held, there are discourses on Mahabharata during the day and at night scenes depicting �Arjuna�s Penance� are staged in the form of the divine art of Kattaikuttu. According to tradition, the characters go to the sanctum-sanctorum of the temple, receive the blessings of the presiding deity of the temple and then proceed to the stage to exhibit their performances. This art lays stress on worship and is therefore endowed with blessings from every side. Therefore it stands to reason that the art is a very noble one. When scenes predicting the worship of special Gods who are to be staged in between the scenes, the performers go to the specific temples allotted to the respective Gods (i.e. the ruling deities of the respective temples) make special offerings to the ruling deities in the sanctum-sanctorum, worship the deities and then return to continue their performances on the stage. Thus we see that enforcement of spirituals is insisted through this art. Such events which are witnessed directly by the audience in such performances, fills them with awe and they really enjoy a thrilling divine experience, so much so that they forget themselves and become one with the divine folk art. Such performances are a real feast for those who watch such performances being staged. When performers enact the divine roles of divine characters such as spiritual Teachers, Sages, Trimurthis (Lords Brahma, Shiva and Vishnu) and other celestials, the performers get empowered with divine powers beyond them and the performance is staged in flying colors. This is quite common, when such divine performances or staged through the divine folk art. When performers who are not up to the mark take up the roles of great, powerful characters a great divine power extends its over lordship over such characters and excellent performance is staged. Such divine incidents can be witnessed through the divine art. At many times celestial spirits apt for the respective celestial characters get into the bodies of persons who take up the roles of such celestials and work wonders. It really requires several millions of eyes to watch such divine performances being staged. Since celestials presented on the stage are an exact replica of the celestials in the heavenly abodes in all respects, men get the divine blessings of the celestials directly through this divine art of Kattaikuttu. The troupe which engages in organizing the divine art performances can rightly be called as the Earthly Celestial Troupe. Many living and non-living things are at close quarters to the place where the divine art is performed. Such performances which are staged prove advanteous to such things in many respects. The divine sounds, which is a unique feature in such performances have their desired impact on living things such as trees, plants, shrubs, herbs, climbers, creepers, animals, birds, insects and other living things ranging to highest category of mammals namely-man or much benefited by such divine sounds. A divine power is passed on to them as a result of the impact of such sounds. The divine performance redeems the soul of the sins committed in the past, and the sins committed during the present birth and paves ways and means for sowing the seeds for good deeds to thrive and thus promote good fortune to smile in lives of men. One can enjoy many benefits of watching and enjoying the performance of a particular divine story presented in the form of the divine art. Many divine wonders which have been taking place sins ages, bear testimony to the statement mentioned above. For instance, if a person remains unmarried for many years after having attained the marriageable age, he should watch the staging of the divine art performance of the divine chapter on Subathra�s marriage. When he does so, he is sure to get married and he can enjoy a happy married life. Those who have less blemishes caused by sins of the past can watch specific divine art performances and acquire benefits in plenty. Those whose souls carry plenty of blemishes and can be bestowed with best benefits by baring the cost incurred for staging and by actively organizing such divine art performances and by watching such performances being staged. Moreover, if we engage and involve ourselves in the art it will bring joy to out hearts and souls, and the blemishes will be removed by the blessings of the celestials. The divine art serves as an ideal medicine which cures diseases caused by sins. By organizing such divine art performances and by taking medicines received from the hands of holy persons who enact the roles of spiritual characters, diseases can be cured. The famous divine treatise on medicine named �Kagabujandar Magical treatise in Medicine� written ages ago by the great preceptor Sre Kagabujandar clearly lays down the prescribed episodes which contain the prescribed characters and scenes and the circumstances which have the power of curing the prescribed diseases. Sre Bhaaskharamaharishi is well versed in the divine treatise on medicine mentioned above. So it is advisable to consult the maharishi and apt according to his divine advice and seek a remedy. Thus it is quite obvious that one can redeem his soul of his sins and cure the diseases present in his body by seeking the divine aid of this sacred art. The epic Mahabharata forms the basis of support for the divine art. All the divine characters equip us with knowledge of the moral code of laws. Lord Krishna advises his disciple King Arjuna all the moral code of laws enlightened by the holy characters portrayed by the epics, in strict accordance to the law of righteousness in a separate holy treatise, Bhagavatgita, at the time when the Great Mahabharata Battle takes place. Each and every charater in the Mahabharata imparts divine principles. There is a character of King Karna figured in the Mahabharata. King Karna did well to his last breath to those who had fed him and he remained a loyal servant to them till the last. King Paanjala (ruler of the kingdom of Paanjala and the father of Paanjali) the noble character figured by the epic teaches us that we should live up to our promises even when tests and trails are at their heights and inder us. We should undergo any hardships to keep up the promise. The divine character Draupadi teaches as that we should conquer and destroy evil by the help of great divine powers. The characters Bishma and Dronacharya advise us that we should never fail to point out the faults, though they are the faults of the King himself. The character Bishma enforces courage in critical situations for the common good. The character Viraadan teaches us that we should be grateful to the last to those who have done good turns to us and we should help our friends when they are in dire need of our help and be faithful to him (friend). Kunthidevi and Mathradevi lay emphasis on morals such as mother�s love and affection, the unity which should be fostered amidst our relatives, inorder to maintain peace and harmony within the basic unit of family. It lays stress on the great philosophy which instills moral code of laws a woman should abide by, to lead an ideal life and up bringing of children by adherence to morals. To sum up it can be said that the folk art brings to light several millions of moral principles which should be adopted by man to make all good fortune smile on him. Taking into account the number of divine drama staged (since ages) in the form of the divine folk art we come to understand the episodes from the Mahabharata account for more then Twenty other dramas staged from episodes according to Hindu Mythology account for more then Twenty. But copies of many dramas were either lost or destroyed by the passage of time. So only certain dramas adopted from divine texts are being staged these days. Here is list of divine dramas staged by the artist of today. 2. Subatra�s marriage with Arjuna. 4. The game of dice and the disrobing of Draupathi. 6. Draupathi the divine fortune teller at King Duriyodhana' court. 7. The destruction of Keechaga. 8. Lord Krishna�s role as messenger. 9. War waged by Abimanyu. 10. Salvation of King Karna. 11. Eighteenth day War (Destruction of King Duriyodhana). 12. Aravaan offered as sacred sacrifice. 13. Sundari�s Marriage with Arujuna. 14. The Great Holy sacrifice of King Thakka. 15. Rama crowned as King of Ayodhya. Right from His childhood he had develop a great love for the divine art of Kattaikuttu. He enjoyed many divine art performances and experienced and delighted in the knowledge of all aspects of the art with great spiritual fervor. He stands as an outstanding personality who enjoyed the art and delighted in witnessing the art performances with extreme devotion. The Maharishi was born and brought up in the village of Sothiyambakkam which lies within the celestial border of Kanchi. The maternal ancestors and his relatives were well versed in the art, so he developed great enthusiasm. He had the good fortune of acting the divine roles of Karna, Arjuna, Vedaviyasa and Sahadeva when he was only a lad and earned name and fame by his powerful divine performances. Sre Bhaaskharamaharishi, who had developed a great love for the folk art right from His childhood days, has part of his divine services, organizers and stages many such divine folk art programs and contribute his encouragement to the growth of the art, since many years. With the blessings of Sre Kagabujandar and through the divine treaties written by the great preceptor in many volumes he understands the divine secrets and instills light into the lives of men through his divine services which foster the growth of the divine art. (a). Making arrangements to view the divine Folk Art Programme directly. (b). Making arrangements for organizing the Folk Art programs. (c). Making arrangements to view the divine Folk Art programs available through CDs. These troupes undertake many such divine services apart from the ones mentioned above. Thus Bhaaskharamaharishi sows the seeds of goodness in the heart of men with the brilliants and excellence of the glow of the great and completely drives away darkness and evil from the hearts of men. Kattaikuttu Folk Art (Folk Theatre)Service is available from us on payment.The Cd's Are Available From Us for US $ 50 (US Dollars) for foreigners and for Rupees 1000/- for Indians inclusive of postal charges. (1). 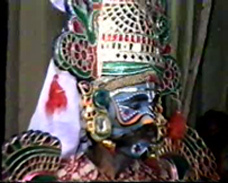 Promotion of three modes of entertainments of India classified as Iyal (Literature), Isai (Music) and Nadagam (Drama) had their roots in the rural folk theatre Preferably Kattaikuttu. (2). Promotion of all Indian Folk Theatres namely Kathakali, Yetchaganam, Terukuttu and Kattaikuttu etc. (3). Promote the general interests of professional Artists belongs to all Indian Folk Theatres namely Kathakali, Yetchaganam, Terukuttu and Kattaikuttu etc on the basis of their own needs, requirements, and visions of the future, while guarding the democratic functioning of the organization. (4). Improve the economic and social status of professional performers engaged on Indian folk theatre Programmes; stimulate the co-operation and exchange between rural performers at the organizational and the artistic level. (5). Explore the artistic potential with improving quality on all Indian Folk Theatres especially on Kattaikuttu. (6). Stimulate the exchange of dramatic expertise and theatre praxis between all Indian Folk Theatres especially on Kattaikuttu performers and representatives of other theatre styles in and outside India. (7). Involve the younger generation in Indian Folk Theatres so as to ensure the continuity of the tradition on all Indian Folk Theatres especially on Kattaikuttu folk theatre. (8). Promote the use of all Indian Folk Theatres especially on Kattaikuttu as and effective medium to stimulate awareness of and discussion about themes relevant to Indian society and culture. (9). Conducting of all Indian Folk Theatre Programmes in India and Abroad. (10). Providing assistance to sick artists belongs to all Indian Folk Theatres especially on Kattaikuttu. (11). Providing education and trainings to young students on all Indian Folk Theatres especially on Kattaikuttu. (12). Providing free food, free shelter and free Clothing for the Artists engaged on all Indian Folk Theatres especially on Kattaikuttu. (13). Providing free education, health and other necessary helps to all Indian Folk Theatre Artists for the Protection and Development of Traditional Arts and culture.